Ireland, 1999, 88 minutes, Colour. Anjelica Huston, Marion O' Dwyer, Ray Winstone, Arno Chevrier, Tom Jones. Agnes Browne is a whimsical piece of Irish blarney. It is set in 1967, focuses on a new widow with seven children, Agnes Browne. She makes a living working at a barrow in the streets alongside her close friend Marion. The film traces how she manages with the children, their growing up, one with a gambling problem, getting loans from the local money shark, Mr Billy (Ray Winstone at his most sinister), attending church. She also experiences the death by cancer of her close friend. Anjelica Huston gives an intense performance as Agnes Browne, part intelligent, part simple, down to earth, yet full of dreams. The film climaxes with a concert by Tom Jones, her idol, and her wanting to get a ticket to his concert when, suddenly, her children bring him home. The film is a blend of realism and fantasy, all the more pleasant for that. Anjelica Huston has an inside knowledge of Ireland because she spent many of her formative years there with her father, director John Huston. 1. The appeal of Agnes Browne? 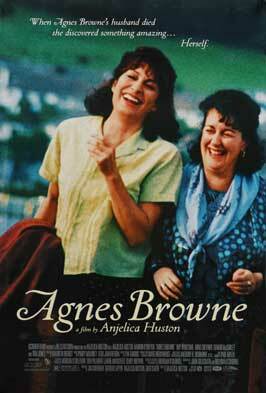 The personality of Agnes, her life, her family, her friendships, her struggles? In Dublin in the 1960s? The way of life, hardships, pleasures, ordinariness? 2. The re-creation of Dublin in the period, sets and décor, costumes, the songs, the music? 3. The character of Agnes: her love for her husband, suddenly becoming a widow, her going to get the cheque for support soon after his death, filling in the forms? Her relationship with all of her children? So many? The support from Marion, their being together, able to talk together? The other women with the stalls and their friendship and support? Going down to the pub on a Saturday night? Her needing money, her going to Mr Billy, his hard deals, verbal contract, paying off the interest? Her continued need for money, looking at the dress in the window, the children buying the dress for her? Her getting the miracle of the money from the union? Paying off Mr Billy and his vindictiveness? Frankie and his owing the money? Agnes and her day-by-day work, going to church, the funeral and the mayhem of the car breaking down and following the wrong coffin? The amusing incidents at home, talking with her older son about puberty, the fights of the family, going to school, school picnics? 4. Marion, a good friend, listening, wise, financially supportive? Her going to hospital, the tests, Agnes not quite understanding? Her husband weeping? The discovery of the truth, going for the driving lessons, her collapse? Her death? Agnes going to the cemetery and praying, asking Marion for the miracle - and the money coming from the union? A portrait of friendship? The portrait of the other women, their chatter, singing at the pub, support? 5. The children, the older boy, puberty, his concern, looking after the others, wanting to leave school, delivering milk, wanting to get a job, the apprenticeship as a carpenter? The twins, the other young boys, the little girl, the baby? Frankie and his gambling, like his father, getting the loan from Mr Billy, giving the money for the dress? His being bashed? Agnes paying Mr Billy off? The children loving their mother, buying the dress for her, going to the hotel for the confrontation, meeting Tom Jones, returning home, the happiness of the concert? 6. Pierre, his work, his store, the lumbering Frenchman, friendship with Agnes, courting her, taking her out, their enjoyable time together, her not being able to marry him because of the children, not needing a man? His accepting this, wanting to be her friend? His being present at the end at the concert? 7. Mr Billy and his offsider, dominating the people, the loans, getting the interest, the brutality? 8. The picture of the church, sympathetic, the funeral, the comedy Irish style, the children going on the parish and school picnic? The church changing at this time, its pastoral reach-out to people like Agnes, Catholicism in their lives? 9. An authentic picture of Ireland - with the exaggerated comic touch?